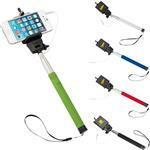 We love this selfie stick. Stocked in Gray in the US but we can do the other colors shown overseas. With a convenient button built into the handle, our monopod connects through the headphone jack on your phone. The spring loaded attachment adjusts to fit most smartphones. Laser engrave on the handle. Grooved barrel design prevents phone from turning. Laser engraved. 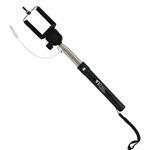 Use our selfie camera stand to snap your photo while you’re on the go. With a convenient button built into the handle, our monopod connects through the headphone jack on your phone. The spring loaded attachment adjusts to fit most smartphones. Laser engrave on the handle. Grooved barrel design prevents phone from turning. Gray available domestically. Other colors available with overseas production.